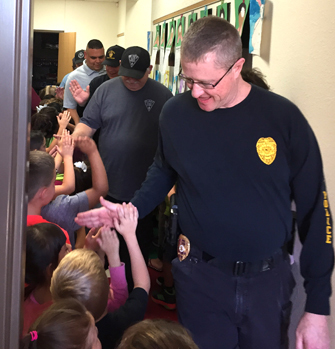 Above, Artesia Fire Marshal Brenden Harvey addresses the students at Grand Heights Early Childhood Center last week during the school’s presentation of gallons of water and Gatorade gathered for the Artesia Fire and Police Departments, the Eddy County Sheriff’s Office, and other area first responders through its annual Thirst Responders Drive. Looking on from the podium is Harvey’s mother, Grand Heights teacher and organizer Diana Harvey. The drive is held in memory of Cpl. D. Robert Harvey, a Lubbock County sheriff’s deputy who was killed in the line of duty. 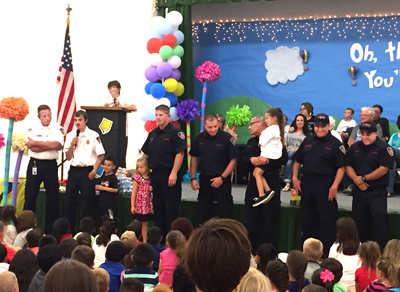 Following the ceremony, the Eager Beavers, right, greeted the first responders and thanked them for their efforts.